VPNHub burst onto the scene a few months ago without warning and are now offering you the chance to test their service for 7-days completely free. Unlike offers from other VPN providers, the VPNHub deal is unique. Not only can you test the service completely free for 7-days, it’s also unrestricted access. This means you can test the full service without payment without any restrictions. You’ll get access to the same service as paying customers. Can I really use the service unrestricted? Yes, the 7-day trial is the same as the full subscription service. There are no data transfer limits, restrictions on what services you can use or restrictions on which servers you can access. You’re allowed to use the full VPNHub service completely free without any restrictions. Works to unblock US Netflix. Includes Windows, Mac OS, Android and iOS apps. Connect to over 49 countries worldwide. Servers in the US, UK, Australia, Switzerland, Canada and more. Use 1 subscription on up to 3 devices. Try completely free for 7-days! Is it really free for 7 days? Yes, I signed up to test the service myself. You will need to enter some payment details to take advantage of the deal but you’re not charged anything. If you want to keep the account after the 7-day trial then you don’t need to do anything and you’ll be charged for your first month after the initial 7-day trial. If you find that the service isn’t for you then you can simply cancel without question and you won’t be charged anything. Why does ‘VPNHub’ sound familiar? If you’re trying to put your finger on the familiar sounding “Hub” name of the service then you would probably be correct in your assumptions. VPNHub is owned by the same company that owns the large adult website which also ends in Hub (Hint: PornHub). 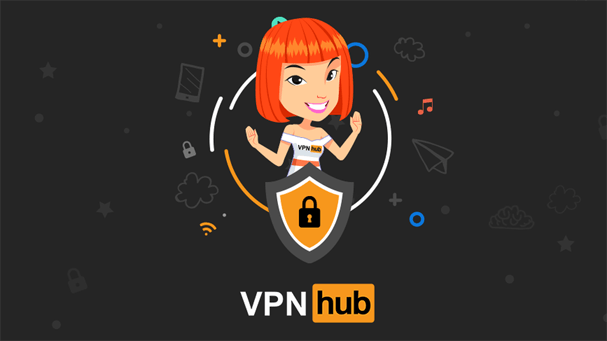 It may seem strange for VPNHub to be owned by the same parent company that owns multiple adult websites but the two are not in fact connected in any other way but ownership. If you stop to think for a minute, many users want to protect their privacy and watching adult content is generally one area where you would want to protect your viewing habits. A VPN will do just that so it actually makes really good sense to launch a privacy protecting service. You’ve also got the knowledge that the service is run by a huge company. If you’re worried about any payment, website or other adult connections then you don’t need to. The VPNHub website or service isn’t linked to any adult content. How do I take advantage of the 7-day trial? All you need to do to test VPNHub restriction free for 7-days is head over to their website. Once there select the ‘Start your free week’ option or their regular ‘Sign up’ option. Then enter your name and email address. You’ll need to enter some payment details but no payment will be taken. If you decide you don’t want to continue with the trial then you can simply cancel before the 7-days pass and you won’t be charged anything. Have you signed up and tested the VPNHub service? What did you think? I would love to hear your thoughts in the comments section below.